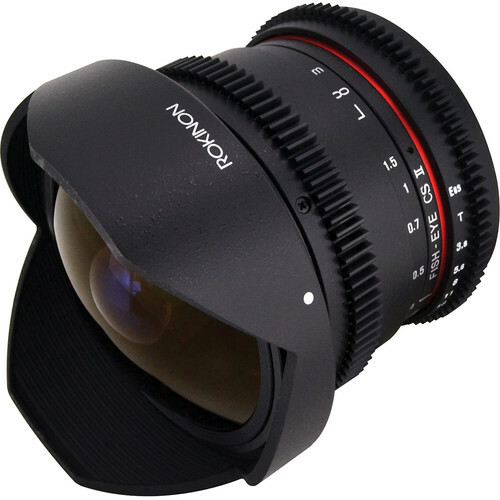 The Micro Four Thirds mount Rokinon 8mm T3.8 Cine UMC Fisheye CS II Lens was developed primarily for film and video applications. The cine version of Rokinon's 8mm lens features industry-standard gearing for the focus and aperture ring, and the aperture ring has been de-clicked for smooth iris pulls. The aperture and focus scales have also been relocated to the side of the lens, where it is easier for focus pullers to read them. This lens is compatible with Micro Four Thirds-sized sensors and provides a 35mm-equivalent focal length of 16mm. Its 139.3° angle of view makes it well-suited to creative applications. The optical construction incorporates one hybrid aspherical element to reduce chromatic aberration and distortion to produce sharper imagery. Additionally, a UMC coating has been applied to lens elements to minimize lens flare and ghosting for more contrast-rich images. 139.3° fisheye lens is ideally suited for creative applications. Box Dimensions (LxWxH) 8.8 x 6.8 x 4.7"
8mm T3.8 Cine UMC Fisheye CS II Lens for Micro Four Thirds Mount is rated 4.0 out of 5 by 1. Rated 4 out of 5 by Eugene Lee from Solid Fish Eye for GH4 I use this on my Panasonic GH4. Solid build quality and the geared rings for focus and the de-clicked aperture are helpful though not entirely necessary, considering it is a fisheye lens. But as a preview to Rokinon's other Cine lenses, the quality and follow focus compatibility on the cheaper side, will have me considering their glass from now on. The lens definitely has some weight to it, especially when comparing to Rokinon's extremely lightweight 7.5mm T3.8. Could be a negative for some, but I like that additional heft, especially when using such a lightweight camera like the GH4. And I often use it with my Glidecam XR-2000, which seems to work better for me when the top is near maximum weight, so that helps too. The T3.8 isn't ideal for most indoor shoots without controlled lighting (ditched it after trying to get some shots at a wedding), but can't complain too much. Though expected, sometimes, the picture quality on the edges of the frame become particularly fuzzy, regardless of it's focus. Overall though, it is what I expected and was worth the purchase. Is this compatible with the Panasonic GH-2? Yes it is. The Panasonic GH2 has an MFT mount, which is the kind of mount this lens offers. The 360 model is different from the normal pictures. Which one is the actual lens? The main images are correct. I have alerted the web department to check on the 360 image. We thank you for your patience and understanding. Whats the difference between this version and the Rokin 8mm non Cine lens? Optically, they are the same. They both have removable lens hoods - which in reality might not do much since the lens is so wide. It is a good idea, unless you want some flare, to keep the least amount of sun from directly hitting the lens. The Non Cine version has a smooth focus ring, the Cine version has geared teeth to mesh with the standard pitch gears on follow focus systems. The focus scale is also printed to the side to allow a focus puller to accurately focus the lens during a shoot. The non cine version is rated at F/2.8 which is the mathematical configuration of the size of the aperture opening compared to the focal length. The T stop, used to measure true light transmission through the Cine lens is T/3.8. This more accurately tells you the amount of light the lens will actually put through the glass. Also, Transmission ratings are supposed to be universal if calibrated correctly. T/4 on one lens should give the same amount of light passing through it as another lens at T/4. I can say from using the 8mm, there is of course barrel distortion, but it is truly remarkable. For the money the lens is very sharp, and I have used it many times - especially in some of the independent films I work on. You need to show an entire room without fisheye distortion? Gran the 8mm!